The event was lots of fun. We had over 120 attendees and a wide range of topics/discussions/arguments. You can check all the action on the flickr stream. I’ve been talking about BarCamp for a while and it exceeded expectations. 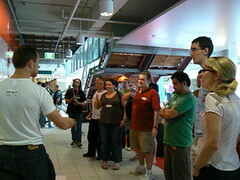 Stay tuned for the next BarCampSydney, some time in June 2007!